NOTE: I posted this article first in 2012 - but as best indication of how TRUE this Article is, how it captures the "Good Cop Bad Cop" SCAM that Republican, Democrats and right-wing Media, aka Wall Street owned Media, are playing on US, every Word of it remains TRUE for Tonight State of Union address. So really watching the State of Politics and its coverage in the right-wing lying Media, is like watching a Bad re-run of the Movie Groundhog day. 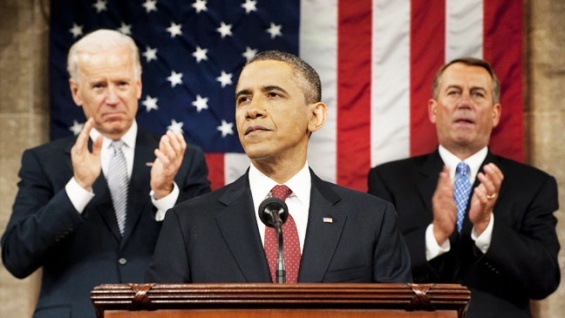 So tonight is the State of Union address by Obama. But you do not need to watch it, for I can tell you exactly what will be told by Obama, exactly how Republicans and right-wing (lying War Mongering Fear Mongering) Wall Street Media, will react to it, and what will come from this State of Union address for American people & cities. "lets have sensible Gun laws as they have in other Developed Nations"
etc. Common Sense steps, as he has done in last State of Union Addresses. To which obvious and token statement Republicans will remain hands crossed and faces frowned and the Ultra right-wing (lying War Mongering Fear Mongering) Wall Street Media such as Fox by some Osmosis will oppose. 2- Obama will state couple of positive things about the JOKE of the health care reform that they passed in 2010 and which plan went into some effect 4 freaking Years after its passage, a health care reform that is a TOTAL JOKE in face of the catastrophe that health care was (and is) for too many Americans, because it is a a health care reform based on plans proposed by Ultra Right-Wing of Republican parry (aka Heritage Foundation), which plan became RomneyCare, but it is not even as Socialized and real as RomneyCare! A heath care reform that is a failure and will be a failure because it is the EXACT OPPOSITE of Government run Universal Socialized health care which is only way to run the health care of a Country. To which Republicans will remain hands crossed and faces frowned, even though again the health care plan Obama Admin passed is a TOTAL JOKE because it is based on plans proposed by Republicans! More on this here. 3- Obama will state one War Mongering after another Fear Mongering statements against some Islamic countries such as Syria & Iran, to which Republicans will Jump Up and Clap and say Hooooooray. And to which the Ultra right-wing (lying War Mongering Fear Mongering) Wall Street Media such as Fox will say that: "He is being Soft on he has not waged enough Wars", even though Obama Admin has Bombed more Countries than Bush! 4- Obama will state that US will do anything for Israel and will spend any amount of Money & Treasure to defend Israel, to which Republicans & Democrats will Jump Up and Clap in 100% unity and will say Yahooooooo and Hooooooray. "Government does not create Jobs..."
"Government take over of health care bad.."
"We know you cannot replace Debt with more Debt"
But when it comes to another Multi-Trillion Dollar War in Middle East, or spending on the Gargantuan Military Industrial Complex, so Gargantuan that we are giving FREE Military to Rich countries of Germany, Japan, South Korea, UK, etc. at the cost of $100s of Billions of Dollars per Year to the American Tax payers, THEN TEApublican lunatics & right-wing Media will be in instant agreement with that spending and then "Our Government will be the Solution..."
So the State of Union Address will further perpetuate the FRAUD & Con Job that Obama Democrats and Republican lunatics, aka Wall Street owned right-wing Media/Cabal, been playing on US. AND Republicans and right-wing lying Media machinery from Wall Street Journal to Fox, to CNBC to the psychos on Talkradio, etc. would not be able to oppose it and call it "Socialism" & "Communism" since again this health care, that is Single Payer Socialized health care, is what their beloved Israel & Margaret Thatcher's Conservative party in UK 100% support and Republicans and right-wing lying Media been telling US for Decades and are telling you Today that Margaret Thatcher's Conservative party in UK & Israel are: "Shining examples of free market Capitalism". 1- "Government is the problem not the solution..."
2- "We are having unsustainable Debt & Deficit..."
"Americans want to be Free from Government take over of health care..."
"Americans want Freedom from Big Government telling them what to do..."
while Americans are under the real Terror of going bankrupt due to Health Care costs, which Terror the JOKE called ObamaCare has done not a squat to alleviate since health care in USA is run by for profit Wall Street run Big Insurance & Big Pharma to pay $100-Million per Year to top executives of these Big Insurance & Big Pharma companies rather than being run on Government run Universal Socialized basis as it is in all developed Nations. when for example and this is just one example, Government run Single Payer NHS would cut health care costs and associated Debt & Deficits by 50% while giving health care to all American people, and these incredible reasons are why All developed Nations on Earth, Not 70%, not 80%, not 90%, but 100% of all developed Nations have had Government run Universal Socialized health care for many Decades, including Israel the beloved Nation of Republican lunatics & fraud Obama Democrats. THEN what can you expect to come out of this State of Union Address tonight for American People? While Wall Street Billionaires behind Obama and TEAPublicans and right-wing Media getting Richer and Richer, and to add insult to injury they will turn around and tell us via the Big Media that they control that: "We are having Debt Crisis...." and as the solution they will suggest that we cut the pathetic $1500 per Month Social Security benefits that an average American gets, or will suggest having Americans on Medicare pay even more out of pocket costs, or they will call the Union members getting a Modest $60K per Year Salary to be "Union Thugs..." for getting that modest salary and asking for a reasonable increase to that modest salary while they are getting paid $50-Million per Year and more and flying in their $100-Million Private Jets to their $40-Million Mansions. And it is amazing to realize how USA is not actually a Democracy but an Oligarchy run by the Wall Street Billionaires and the Military Industry. Really amazing stuff! OMG, you were totally right. Exactly what you predicted is what was was said by Obama, exactly as you said was the reaction of Repugs! What are you some sort of Time traveler? No. I am not a Time traveler. But just have seen these Republicans, Democrats & Wall Street Media/Cabal run the same SCAM on US over and over. Resulting in USA lacking the most basic and essential of Social services that all Developed Nations have, which will take Trillions of Dollars per Year from the Wall Street Class and pass it to the Middle Class, as a result of which American Middle Class is much WORSE off than the Middle Class in other Developed Nations and as a result of which the Wall Street Class are getting Richer and Richer off the back of American Middle Class. But how can We The People allow such SCAM to be perperated on US? This article is so BANG on the Money. Thanks. And try to get the Word out about this Site, as the place for getting the Truth. Well I am sure to email this article to all my friends and colleagues here in Denmark. It is high time that People in Europe know that USA is such as screwed up place that it does not still have even the most basic of social services such as Government Run Universal Socialized healthcare, something that all Europeans have had for 30+ Year. And on top of that there are People (Republicans) running for office that call the Universal Socialized healthcare that we have in all European Countries to be "Socialism" or "Communism"
How FAWKING EVIL do you have to be to such a thing! Reporter: Tell me, what is that you would like President Obama to say in his State of the Union Address? Please, tell me! And while you're telling me that, please, also, tell me just who in the world tells the TRUTH except for you? Obama the FRAUD.. Obama this and Obama that! You know who the real FRAUD is? It's YOU.. and all who think like YOU DO! I think the Author has answered your question in depth. 1- Government Run Universal Socialized healthcare (NHS). Because NHS is absolutely essential to well being of a Nation in today's Modern World and that is why it is 100% supported by all Conservative parties, repeat all Conservative parties, in Europe, Canada, Australia, including Israel the BELOVED Nation of TEAPublican & Obama Democrats & Wall Street right-wing Media. Such as the fact that NHS beside giving Healthcare to all American People it would cut spending due to Healthcare by 50% which means cutting US Deficits, which TEAPublican lunatics are all of a sudden so worried about, by $1-Trillon per Year. Keeping in mind that the JOKE called Obamacare has made NO real difference in catastrophe that healthcare is for 100-Mill+ Americans, because it continues to operate Healthcare on for profit Wall Street basis. 2- Cut size of the US Military to be in line with the size of the US economy to World economy. So this means that given the fact that US economy is now about 15% of World economy and World Military budget is about $700Bill, then this means cutting US Military budget down to about $200-Bill. Note even at this amount US will STILL have Worlds largest Military budget BY FAR, that is how astonishingly Gargantuan current US Military budget at reported $700Bill per year is. 3- Bring US troops home from Europe, South Korea, Japan, etc. – after all these countries economy are doing MUCH BETTER than US economy and they are NOT paying US a dime for this Military protection and they do not have a threat that they cannot crush on their own. Lux Man, you have gave a gr8 answer to Okinawa. Glad to see that more and more American People are waking up to the Con Job that the Wal Street Class & Military Industrial Complex are playing on US. Hum! Really amazing the Con Job and SCAM that Republicans & Democrats & Wall Street owned Media are playing on US the American People. Really how stupid to they think we the American People are? Free trade is not trade. It divorces investments from production and moves production anywhere globally for sake of cheaper labor and more profits for a few. Germany does not ship their jobs out of the country. Denmark is a small country. There is no way to compare. They are not doing that well either. Yes, I could not agree more.